Have you noticed a spike in clothes with optical illusions, especially for kids? I've seen a great number of styles for both girls and boys that give the appearance of three dimensional details of embellishments and accessories. What's not to love about getting the look without the full commitment? 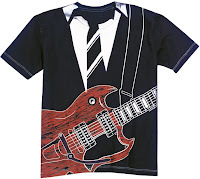 These faux accents are very popular on t-shirts using a screen-print method. Sometimes the flat graphic is combined with a small amount of actual ornamentation which 'tricks the eye' even more. For instance, the picture of many layered necklaces seems more real with an added bit of glitter. 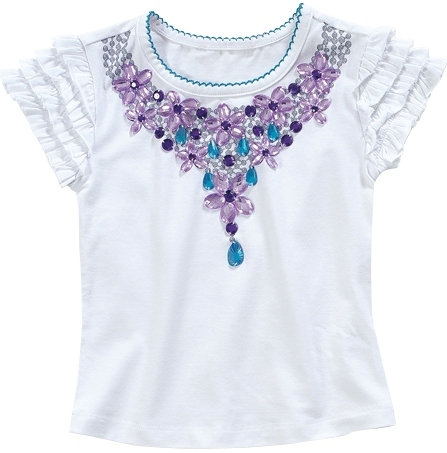 Our Flower Necklace Top is printed with silver chains and jeweled with rhinestones, creating a flower necklace. This fashion statement comes in a variety of intensities from subtle to over the top. Our Personalized Jersey Tee is printed to look like a baseball jersey. Buttons, stitching, you name it, it can even be personalized with your child's name above the number on the back. Our Black and White separates group of black cotton with white printed detailing resembles formal wear like dress jackets and ties for boys. 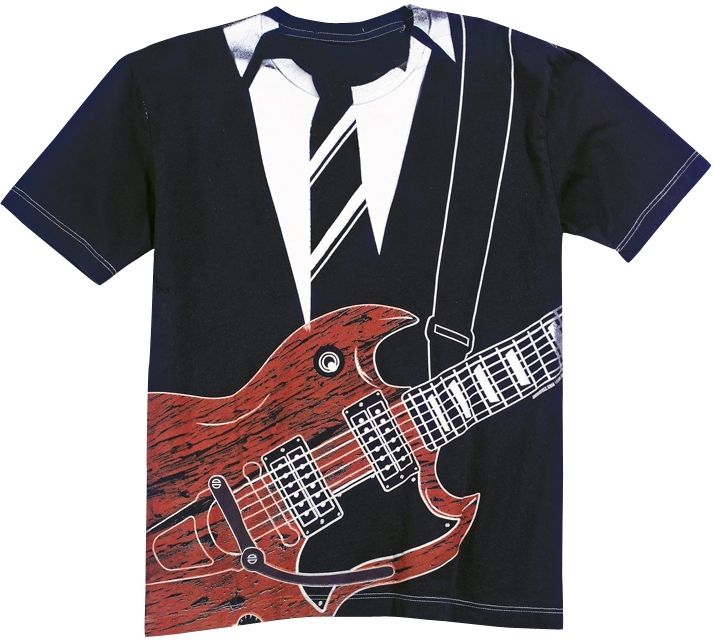 Additionally, for the rock 'n roll in a suit type, the collection features a graphic overlay of a guitar complete with strap that will have you looking twice. Animal prints are everywhere! The likeness of feline markings of leopard and tiger as well as zebra has long been featured on fashions world-wide. For girls, this style is fun not fierce, especially in the more whimsical combinations....visually it's something along the lines of a Pebbles meets Tinkerbell look. For Spring/Summer 2011 these beloved prints continue to thrive in shades that resemble the animals in nature, although we are beginning to see more variations in unexpected color combinations. In mixing these exotic prints with other elements like flora patterns and ruffles, a modern twist is added to the already unique style. Our pink and brown Leopard Skirt is hemmed in tulle and absolutely adorable paired with the Dancing Fee Tee which features a screen-printed version of the same leopard pattern at a smaller scale. The animal kingdom craze doesn’t just apply to day wear. The short PJ set and sleeveless ruffle nightgown are also available in zebra, not to mention our Zebra Pajama Set sold with matching eye mask. 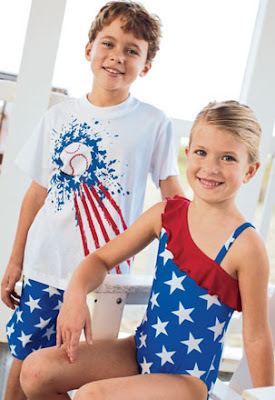 Animal prints are a super popular motif in swimwear this season as well. With a skirted top giving an illusion of a one-piece suite the Leopard 2-piece is perfect for even the youngest of fans as sizes range from 2T-14. 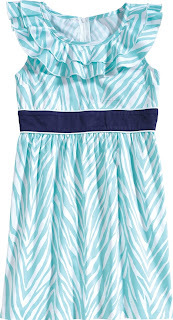 Don't forget dresses....this lovely zebra dress in shades of blue is still conservative and cute, with a pinch of flair. So, get hunting for your very own animal prints and GO WILD! Just a few weeks ago I found myself consoling my wife, Steph, as she experienced a bittersweet moment at breakfast one morning. Our seven year old son, Peyton, asked his mother to make him breakfast and she responded by saying she would, after she finished typing an email. Peyton decided he wanted jelly toast, so he waited a minute or two and then got the bread, butter, and jelly out on his own. My wife heard some action in the kitchen and called out to let him know she would be there in a second, to which he replied, "it's OK, I can do it". Steph stopped what she was doing and went to help. He once again repeated, "it's OK, I can do it! ", only the tone was a touch more stern the second time around. Taken aback, my wife asked him if he was upset. He said no, but made it clear that if she continued asking him if he needed help, he would be. So, Steph shares the dialogue with me, and as I laugh about it, she stared laughing too, but I could tell it stung a bit. 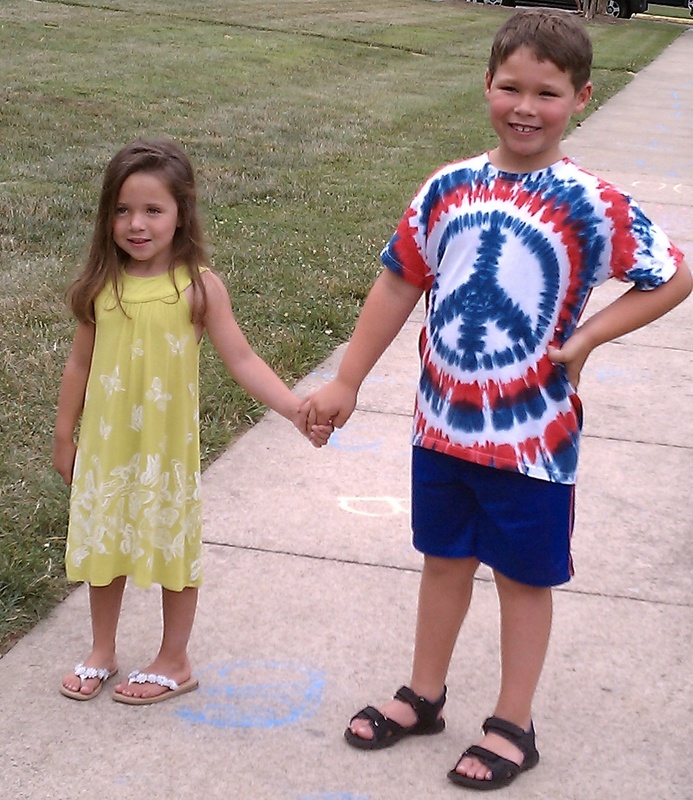 Both of our children are very independent and the older they get the more prevalent if becomes. From food choices to music preferences, my wife and I are constantly amazed how fast our children are growing up, and how many times they no longer need our help. Have you had a similar experience? Share it with us here, or on Facebook. Here they are on the last day of school...another year older. There's no doubt about it, little girls love ruffles. From mini-frills to lots o' layers, they are, as my daughter says, "oh, so cute!" And I have to admit, after seeing my daughter wear them practically since birth, it's truly the best way to describe them. This season, children's wear collections are featuring flounces for girls of all ages. You'll spot them at the neck, across tops, and along hems. Regardless of the placement, they're sure to sweeten up any silhouette. The more traditional ruffled dresses and skirts in cotton or satin are still popular today as mothers and grandmothers will agree, cherished as timeless. Even so, this season ruffles are being used to accent many different types of fashions in a number of fabrications. Swimwear, sleepwear, and accessories are showcasing this delightful little detail as well. 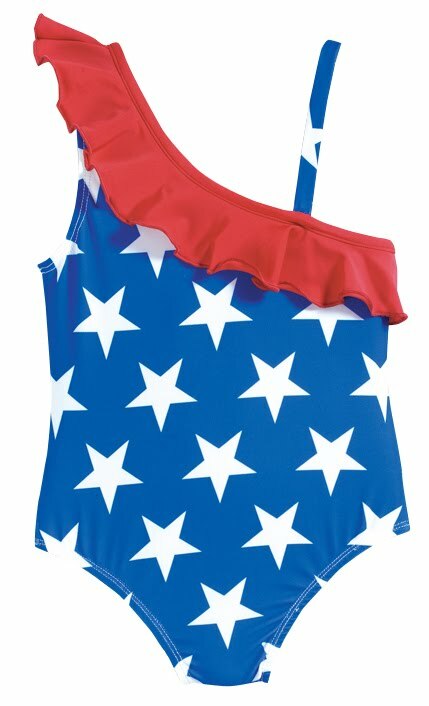 They are particularly playful on bathing suits, especially tankinis. Other swimwear in high demand includes a ruffle trimmed Polynesian printed halter suit, several styles with ruffle skirted bottoms, and a one-piece with an asymmetrical ruffle shoulder strap. Some prefer subtle ruffle enhancements, for others it's the more ruffles the better! 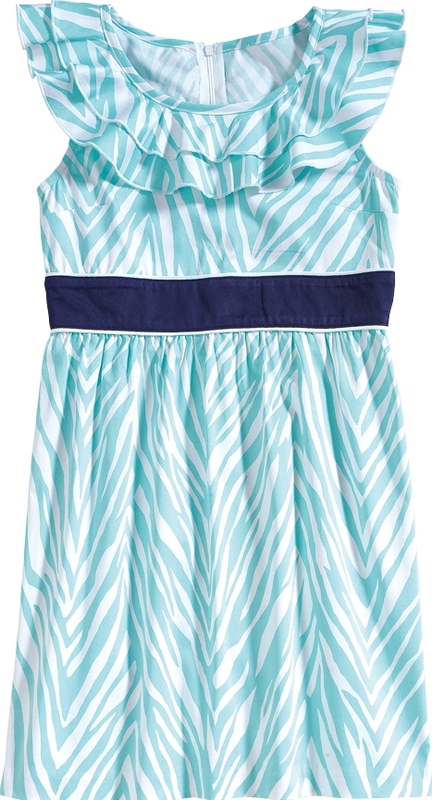 Either way ruffles will add a precious pop to any little girls' garment. 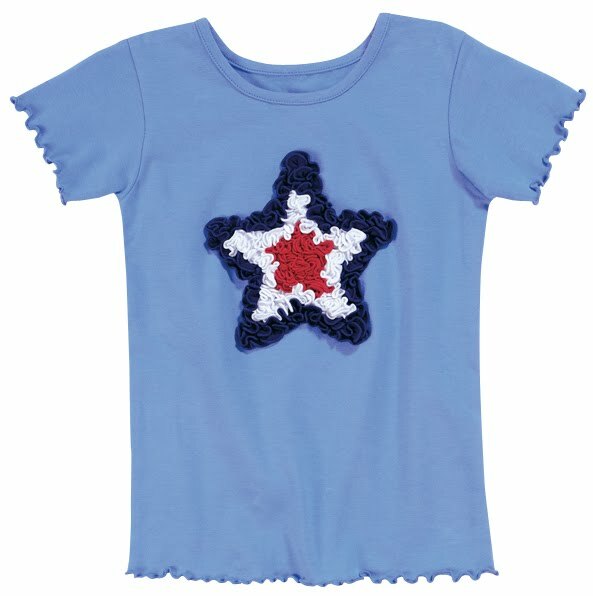 Find their (and your) favorite ruffled styles at www.cwdkids.com. New Clothes For Special Kids! Children Incorporated is a non-profit organization the provides resources for children in need in the United States and beyond. 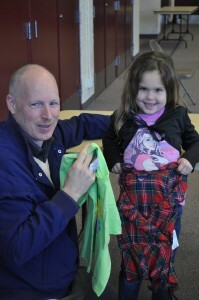 We are proud to have been asked to donate our clothing to a special group of children at a local elementary school. We hope these adorable boys and girls enjoy their new clothes from CWDkids. To learn more about this organization and please click here! Just in time for warmer weather, our spring sale has started. Hurry over to our website, quantities are limited! 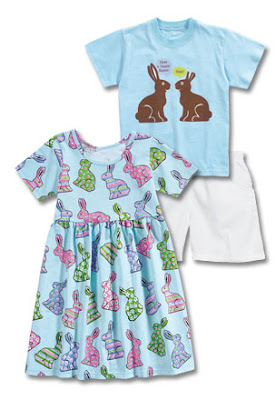 Easter is only a few weeks away and we not only have the perfect outfit to wear on the big day, we also have a HUGE selection of gifts to fill your Easter baskets. From stuffed animals, slippers, and pj's to beach towels and goggles. We have just what you need to get a jump on on the Easter bunny! Take a look here! April Fool's Special! Free shipping on $25 + orders today only! Enter CHWFRE in the coupon code box at checkout. Hurry, offer will expire at 11:59 EST tonight!